Melissa Daley’s novel Molly and the Cat Cafe is a heartwarming story of determination and friendship. But a local battle axe is on the warpath and she is determined to keep out newcomers, especially four-legged ones. It looks as if Debbie will have to choose between the café and Molly. Yet the solution to their problems may not be as far away as they think. 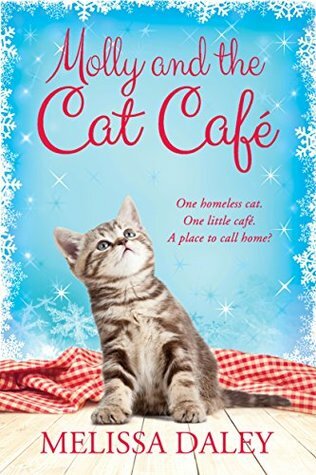 Molly and the Cat Cafe by Melissa Daley is the first book of the Cat Cafe series. This is going to be another that I admit I did not look at closely before picking up and it took me by surprise. I’d received an invite for the second book of this series and as I’ve mentioned I don’t like jumping into things and since book two looked cute I tracked down book one and at first glance at these had thought they looked a bit cozy mystery-ish. Well instead of a mystery what I found is a contemporary story told from the point of view of Molly the cat and it turned into a wonderful read. Molly had been a very spoiled feline living with her elderly owner and the two being inseparable. Unfortunately for both Molly and her owner as time passed her owner began having issues with her memory and her son decided it was time to move her into a care facility. The son was not a fan of Molly and re-homed her into a place with some big scary dogs in which Molly made the decision to set out to find a new wonderful owner of her own leading her to the doorstep of Debbie. Now, having dealt with dementia in my grandmother the beginning of this one began really emotional rather quickly. The author did a wonderful job giving Molly a voice and writing from her point of view through all of her times including the tough beginning to the heartwarming end. The book is one that may bring tears and certainly some laughs along the way too with cat lovers nodding along to some antics. After this first book I’ll definitely be seeing what happens for Molly in book two. MELISSA DALEY lives in Hertfordshire with her two cats, two children, and one husband. One of her cats, Nancy, has a writing pedigree of her own and can be found on Facebook as Nancy Harpenden-Cat. Melissa was inspired by the Cotswolds town of Stow-on-the-Wold, which provides the backdrop for Melissa’s novel, Molly and the Cat Café. Nice review Carrie. Isn’t it nice when you are not expecting it and a book surprises you. I love the cover of this one. I hope you enjoy the second one as much as this one.